The Icon of the Virgin of Czestochowa, which travels the world from ocean to ocean carrying a prolife message, remained Monday through Wednesday at the Catholic TV channel FETV. 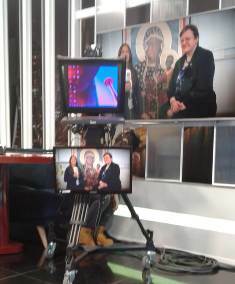 On Tuesday morning, Father Leon Juchniewicz, a Polish missionary who accompanies the Icon, offered mass on the television channel in the presence of the Icon and was later interviewed by Father Francisco Verar, director of the FETV channel and founder of the Community Magnificat. At the beginning of this year, in April 2018 Father Verar was in Poland, visiting the Sanctuary of Czestochowa and had the opportunity to interview Ewa Kowalewska, initiator and international coordinator of this pilgrimage. Now was the opportunity to use these pre-recorded interviews for the first time. The pilgrim icon in the intention of protecting the civilization of life, love and family, the Czestochowa Icon is made by traditional iconographic method, size 1:1. It was applied to the original Icon at Jasna Gora and dedicated on January 28, 2012. From that day on, She has already traveled approximately 190,000 km. Panama is the 29th country to be visited by Her. In the interview, Father León commented that the Pilgrim Icon has already traveled 190,000 kilometers since 2012, when it left the port of Vladivostok in Russia, passing through the Urals, the countries of eastern, western Europe and arriving in Nazareth in Portugal. Then She visited the United States, Canada, Mexico and Ecuador. And today, on the eve of the visit of the Holy Father, Pope Francis, the Icon comes to accompany the Panamanian people.